The accreditation standards and supporting documents provide the direction for program design, operations, documentation, evaluation, and accreditation. 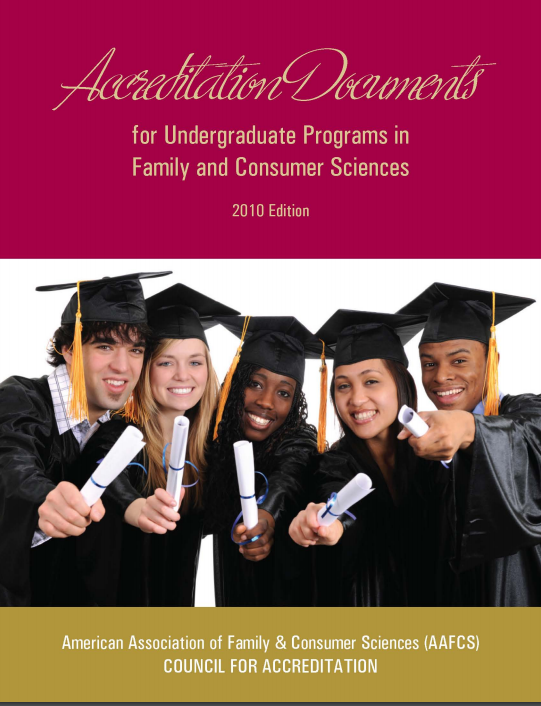 Accreditation Standards for Undergraduate Programs in Family and Consumer Sciences, 2010 Edition replaces the 2001 Edition as the basis for program accreditation by AAFCS. Reflecting the input of more than 100 family and consumer sciences leaders in higher education across the nation and multiple national reviews over a two-year period, Accreditation Standards, 2010 Edition emphasizes current research and priorities for undergraduate programs; the integrated, synergistic focus of the family and consumer sciences body of knowledge; and achievement excellence demonstrated through student outcomes.